We are offering high quality range of Heavy Duty Ripper Tooth. 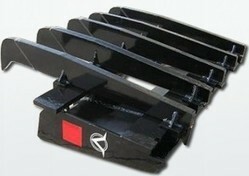 These are used in the ripper tooth buckets that are a type of material handling equipment. Unique Perfect Productions Pvt. Ltd.
JCB Ripper tooth is fabricated for maximum strength using wear resistant steel. Ripper tooth reduces stress load to Carrier which prevents structural damages. 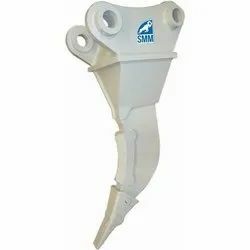 Ripper tooth is an attachment with long angled tooth that fits on Hydraulic Excavator to penetrate and loosen subsurface layers of earth to a depth of up to 3 ft (approx. 1 m). The points lie on an arc about the stick pivot so that the ripped bottom stays relatively flat. Can be used on “Multi-Ripper Products or conventional Focuses entire breakout force on one point at a time thus increasing ripping force. Buckets to help increase the ripping effect. - Maximum Strength: Fabricated for maximum strength using wear resistant steel. - Replaceable Tip: Replaceable tip (tooth point) for even longer service life. - Reduces Stress Load: Reduces stress load to Carrier which prevents structural damages.